Alcohol Markers AND SO MUCH MORE! Brea Reese is a division of Momenta AND guess what? Momenta is sponsoring our GREAT CANADIAN SCRAPBOOK carnivals this fall in Edmonton and Calgary. These are HUGE events that include classes, shopping, make and takes, treats, giveaways, photography and so much more. It is the perfect event for the scrapbooking and paper crafting fanatic in all of us! A BIG HUGE thank you to Momenta for sponsoring our events – we truly appreciate it! 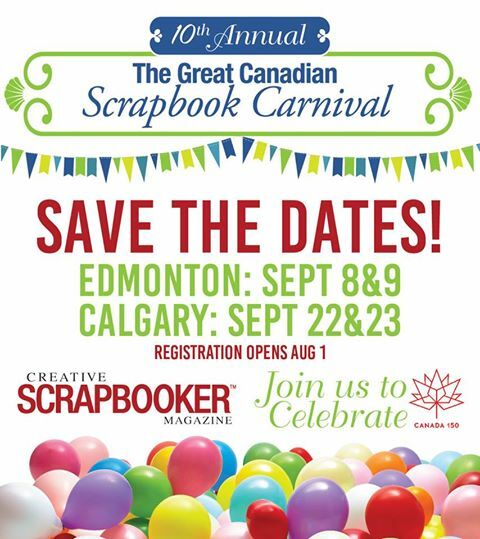 Registrations opens Monday August 1st for The Great Canadian Scrapbook Carnivals – visit our website for all the info!!!! YAHOOOO! We will be celebrating Canada’s 150th birthday!!!!! Do you know where Brea Reese products are available in Edmonton? Are there Canadian retailers that sell Brea Reese? I would like to know where I can purchase Brea Reese products. I am specifically looking for their Glitter Ink / Watercolor Ink. I live in Winnipeg. Are their Canadian retailers that are selling this product. Their ad is in your Creative Scrapbooker Fall 2018 magazine.